Level of difficulty: 4 We are trying to capture a collision between drops manually, which depends a lot on luck. But if the collision does not happen, there are lots of interesting water shapes that happen when we cast more than one drop at a time. Camera on the tripod (as usual). Let's set the set with the background and the orange container with the green stripe (so that the water stays two-colored) overflowing with water. The framing will be only the top of the container and a piece of the bottom. We will use the infrared sensor with its master flash and 2 more that will shoot by photocell - 2 flashes for the background and one for the water. The infrared sensor will be positioned just below the dripper so that the drop passes, breaks the beam of infrared rays, falls into the water and then rises. (See the photo of the making of). Camera in manual mode, manual focus (as usual), camera at 2 or 3 second speed, f.22 (as usual) and flash at 1/64 power (as usual). Leave the iso at 100 but if the photo is dark, increase to 200, then 400, then 800, until the exposure is good. Focus exactly where the drop will fall. Use the center of the container as a guide. I used a pencil to focus. Turn the sensor on and test with your finger. Leave the delay button to 1/4 of the power to test which moment of the falling the flashes are freezing. If you are registering the crown, increase the delay because in this photo we want the collision of the second drop and the rebound of the first. If the drop movement is already finished, decrease the delay. 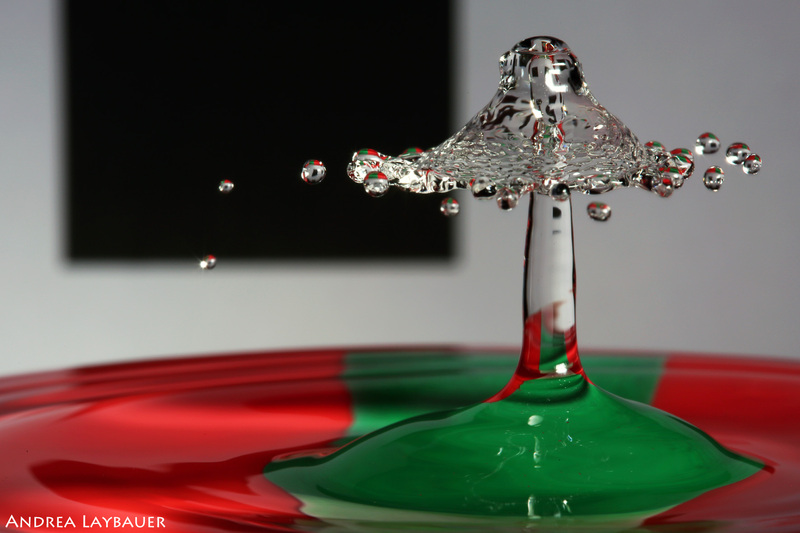 Turn the lights off, trigger the camera, toss a few drops and wait for the camera to close. See the result. If the focus is perfect and the freezing moment is in the rebound, turn off the lights and "it's show time." Think that the goal is to throw a second drop on the rebound of the first so that they colide, one rising and one descending. We know that the time interval between them, for this encounter to occur, is around 80 milliseconds. This time is imperceptible to our senses and impossible to be told from the head or with a stopwatch. The technique I use is to realize the force I need to make in the dripper to throw a single drop and try to keep it constant so that a sequence of drops falls. Another option is to think about launching a small jet and then decreasing the force intensity. Focus on the strength of the hand by tightening the dripper. The eyedropper (despite producing a very small drop), the ketchup tube and the hospital serum kit can also be used to attempt a collision. I confess that I am really enjoying the nasal aspirator but it is a matter of adaptation. The flashes are not firing: check that the potentiometers are not bumpy at the ends, see if the environment is dark enough that your finger or drop is able to cut out the beam of infrared rays, check the flash batteries and of course if the Is switched on. It may also be that the two infrared ray sensors are not aligned and therefore the light beam is not being transmitted. The focus on the drop is not clear or have ghosts: refocus as many times as necessary and experiment with a variety of things like clothes fasteners, ruler, pencils, and even adapt to one of them. Focus accuracy should be surgical, and every time you tinker with the camera, focus again. The smaller the diaphragm aperture, the more depth of field you will have. Try to keep on f.22. In the photo the water is stopped, no movement of drops: your delay must be too small or too large because, either the drop has not yet fallen or it has already fallen, has already gone up and already disappeared in the pot of water. Test the variances of the delay potentiometer until "find" the drop in the frame. Less delay = crown. More delay = water pillar with drop on the top. The picture is too light or too dark: as we can not touch the power of the flashes or aperture of the diaphragm, we have left the iso (if the photo is dark, increase the iso and if it is clear, decrease) or change the position of the flashes (If the picture is dark, approach the flashes and if it is light, zoom out). If the movement is trailing: your flashes may be at high power and therefore producing a slow light. Put your flashes in 1/64 power to have a weak light, but fast, around 1 / 30,000 seconds. The flash at 1/1 power usually produces a 1 / 1,000 second light that is too slow to freeze drops. There may also be interference from ambient light. Turn off the lights. 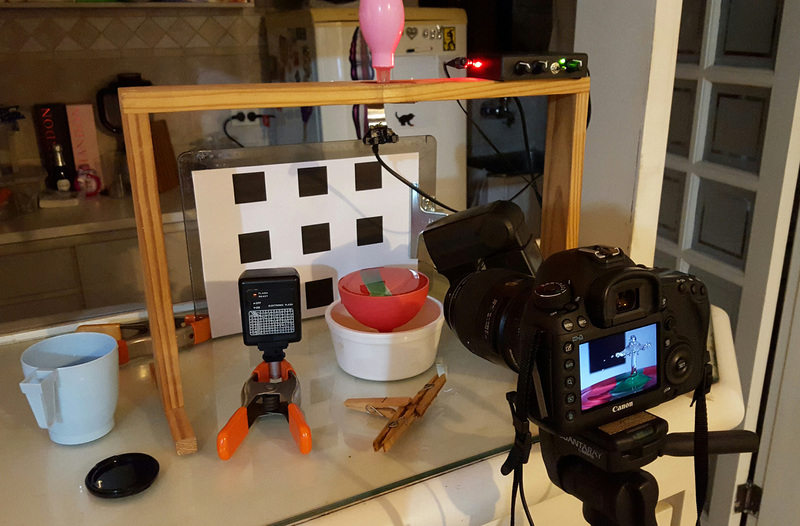 About the infrared sensor: It is a homemade device that allows the flashes to be fired at the exact moment the drop is in the frame. The biggest difficulty of splash photos is tapping the photo at the right time. Everything happens in a tiny fraction of a second that the human eye does not notice. With the use of the device, the water drop itself is the trigger of the flashes and they are the ones that freeze the movement. The technique is done in a dark environment so we can leave the camera open for a few seconds without the ambient light interfering with the photograph. The camera should only capture light from flashes which should last only around 1 / 30,000 of a second.